Premier Kathleen Wynne stopped at the University of Waterloo on Tuesday, January 13 as part of her nine-day tour of Ontario universities. In addition to fielding questions at a student town-hall and sitting for an interview with the UW student newspaper, Wynne also made time to have a private meeting with four representatives of Waterloo’s Graduate Student Association and two representatives from Wilfrid Laurier’s contract faculty. Also sitting in on this meeting were Ontario Minister of Colleges and Universities, Reza Moridi, and local MPPs Daiene Vernile and Kathryn McGarry. The Premier was most interested in hearing about the barriers and challenges faced by both current PhD students and contract faculty. Numerous issues were raised by the doctoral students in attendance, including the need for stronger financial support and broader opportunities for research, as well as their concerns about the future of full-time academic employment. Contract faculty representatives gave the Premier a clear idea of what “future employment” might look like for graduate students as universities struggle to operate with ever-tightening budgets. They made it clear to the Premier that with universities opting for greater use of contract faculty to cope with budget pressures, these faculty are growing concerned with the need for province-wide plans and provisions for job-security, access to benefits and measures that would monitor pay-equity/ fair compensation. Both the graduate students and contract faculty voiced their worries about the eroding of quality education in the province through budgets that seem to restrict the hiring of tenure-stream faculty and, even more disturbingly, through the cost-savings being realized at a growing number of institutions through the use of undergraduates as teaching assistants. Notes were taken by the Premier’s assistant at the meeting and Wynne was very attentive and thoughtful in her questions. The meeting, however, was very clearly a “fact-finding” mission and, therefore, there were no clear statements by Premier Wynne regarding how the information being gathered would be used in the future. Photo back row (left to right): Hon. 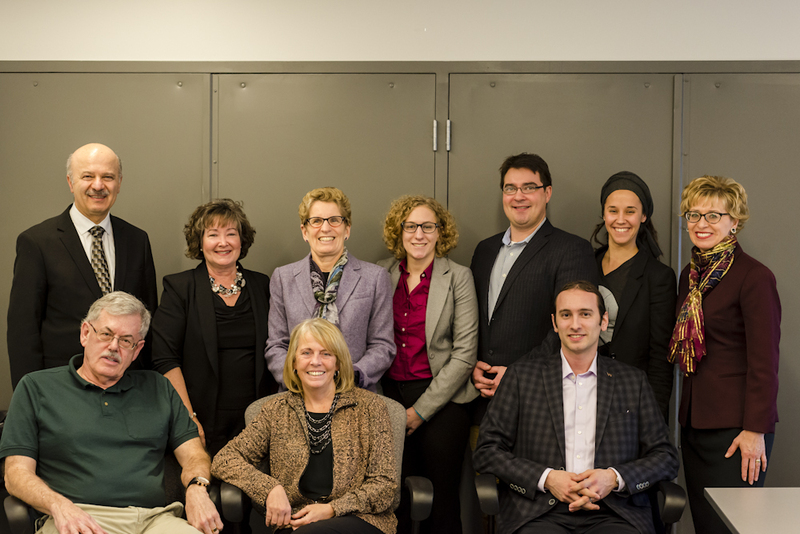 Reza Moridi, Kathryn McGarry (MPP), Premier Wynne, Maya D’Alessio (UW, GSA), Mike Makahnouk (UW, GSA), Coleen Even (UW, GSA), Daiene Vernile (MPP). Front row (left to right): Jim Gerlach (WLU, CAS), Michele Kramer (WLU, CAS), Robert Henderson (UW, GSA). The Premier was most interested in hearing about the barriers and challenges faced by both current PhD students and contract faculty. Numerous issues were raised by the doctoral students in attendance, including the need for stronger financial support and broader opportunities for research, as well as their concerns about the future of full-time academic employment. Contract faculty representatives gave the Premier a clear idea of what “future employment” might look like for graduate students as universities struggle to operate with ever-tightening budgets. They made it clear to the Premier that with universities opting for greater use of contract faculty more to cope with budget pressures, these faculty are growing concerned with the need for province-wide plans and provisions for job-security, access to benefits and measures that would monitor pay-equity/ fair compensation.